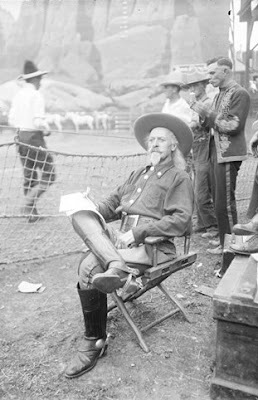 Portrait of William Frederick (Buffalo Bill) Cody (1846-1917), sitting in a director's chair with members of his travelling show standing behind him. Scenery painted to look like Rocky Mountains is visible in the background, as are horses (real or painted?). Cody was a buffalo hunter, U.S. Army scout, and Indian fighter who dramatized the American West in travelling shows. Buffalo Bill's Show took place at the old Cubs' ballpark. Horses, cows and bulls graze in the field at the old Cubs' ballpark. Painted scenery, with Rocky Mountains and pine trees, is propped in the back of the field, next to the grandstand. 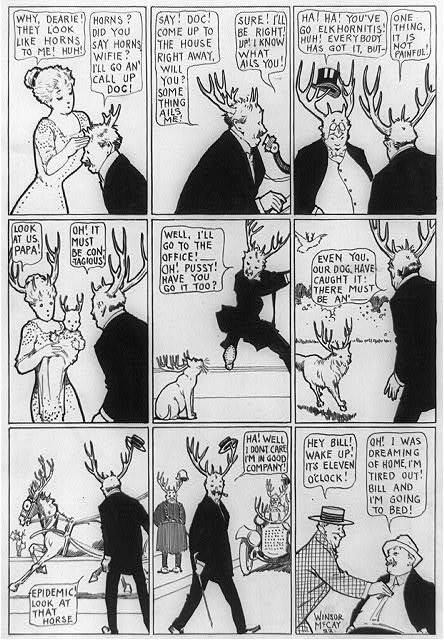 The animals and scenery were part of Buffalo Bill Cody's travelling show.